Been a while since I've written here! Let's just say that I discovered Twitter in the meantime and have grown fond of posting shorter "tweets" than writing an entire blog post. But that ends today! This post is about a campaign that I've been thinking about for the last little while, one that I started out hating but have increasingly grown to love. That campaign, of course, is from Koodo. Let's start, however, with the brand's launch campaign. 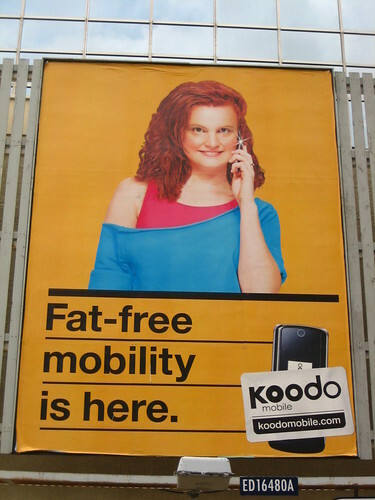 Seemingly out of nowhere, Koodo launched in 2008 as Telus Mobility's answer to Bell's Solo and Rogers' Fido brands - a no frills, value-oriented brand for those who are scared away by the big contracts and hidden fees that were standard when dealing with any of the big three. The brand also aimed to appeal to the younger, Virgin Mobile crowd with its quirky personality, fun colours, and advertising that was anything but normal. There's no doubt that the creative cuts through the clutter. The startlingly bright colours, 80s humour, and Koodo-cised words stood out in all of the environments in which they appeared and were nothing like we had ever seen in the category. No doubt that they had to work hard: introduce a new brand (its personality, values, promise, and devices), new plans, and compel people to sign up. Where the launch campaign lost me was the fact that the creative was very polarizing. You either absolutely loved it or you hated it with a passion. I know that advertising that's polarizing, that evicts strong emotions, can be a very good thing, but I was on the wrong end of the spectrum. I hated the brand, and I'm sure a lot of people did too. Gingerbread Men, Aliens, and "Big-billification!" The next phase of the campaign dropped the idea of using metaphors completely, and instead emphasized the quirky 80s personality of the brand and a made up vocabulary that was meant to highlight the brand's benefits and become a fun part of the mobility lexicon. The creative moved away from the original brand idea of "fat free mobility" and, seemingly every few months or so, introduced a plethora or new characters and themes that went from weird to weirder. My personal take: this phase of the campaign was nothing short of terrible. The creative was off-putting, rather than involving, the Koodo-cised words were impossible to guess when jumbled and bewildering even when they were revealed (making the word jumble spots pretty much pointless), and lost the value brand messaging among an explosion of 80s weirdness. Not to mention the fact that the brand's re-occurring tagline and mnemonic, "Good Call", had no tie to the creative and is never explained or called out in a meaningful way. Establishing a coherent and differentiating brand personality? Done. Portraying that personality in a meaningful, engaging way? Not so much. 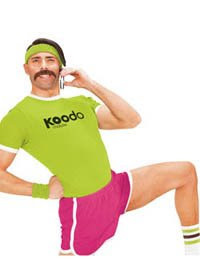 And then, something startling happened: Koodo found its groove. 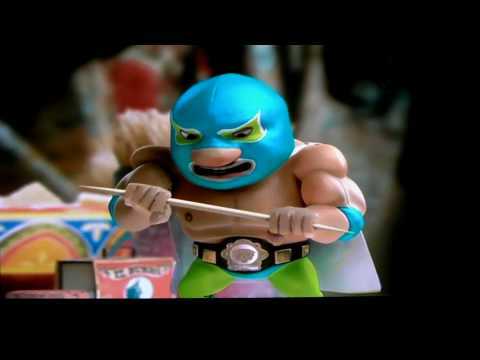 After two years of annoying, non-sensical creative, they stumbled upon a funny, endearing, and engaging brand icon and spokesperson, non other than a tiny Mexican luchador fittingly named "El Tabador". 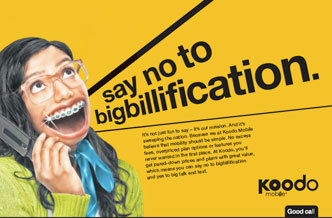 The new campaign retains all of the brand personality (sarcastic tone and manner, neon colours, tongue-in-cheek writing) and Koodo-cised vocabulary established in past campaigns, but succeeds by adding several important elements. The campaign also includes a very clever YouTube video-based wrestling game in which you (the viewer) get to take on El Tabador's arch nemesis, "Bloatimus Contractimus", in the ring. Each time you land (or take) a hit, the announcers call out some of the benefits of being with Koodo. It's impossible to defeat the enemy on your own, of course - at the end it's El Tabador to the rescue. Below is a video of the whole wrestling sequence, but it's much more fun to play the game at Koodo's YouTube channel. 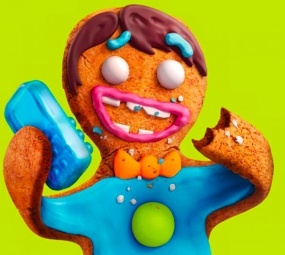 It will be interesting to see if Koodo will decide to stick with their minuscule Mexican mascot in the foreseeable future, or send him the way of the gingerbread men! Can't find it either... sorry! His name is Carlos Diaz.